So when someone gives you a gift like that, they’d return give them . . . the best they made, not just a plain old thing. They’d make it so fancy, you know, with everything in it. The atigi or parka (a word of western Siberian-Russian origin) is a hooded, loose-fitting garment worn by both men and women. New and traditional designs are still made in Northwest Alaska today. 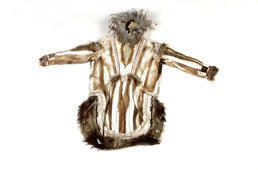 Historically, parkas were sewn from a variety of pelts—caribou or reindeer, ground squirrel, muskrat, marmot, mink, fox, mountain sheep and lynx, as well as from bird skins with the feathers left on. (1) Prior to the introduction of reindeer on the Seward Peninsula in 1892, Iñupiaq people traded across Bering Strait with Siberian Chukchi herders for white or spotted reindeer skin, which was used for making fancy parkas. (2) North coast Iñupiat traded with interior villages for caribou hides, as well as other animal skins such as wolf, wolverine, mountain sheep and fox. (3) Caribou and reindeer were often taken in the summer when the skins weighed less and the hair was finer and shorter. (4) These light skins were used to make fancy clothing and inner garments. (5) Plain parkas for everyday wear and for colder weather were made from heavier fall and winter skins. Similar parka patterns were used over wide areas of Northwest Alaska, but always with a distinct difference between men’s and women’s styles. At the neck, both men’s and women’s parkas usually had narrow, triangular inserts, or gores, that extended part way down the front, as on this example. These gores attached the base of the hood to the front of the parka. Men and women usually wore belts around their parkas. A woman’s belt—often ornamented with ivory carvings, metal buttons, beads or (in the Barrow area) wolverine feet—helped support a child carried against her back inside her parka, which was cut with extra space at the base of the neck and upper back to accommodate a child.